Hello everyone! I'm so happy that it's Thursday, one of my favorite days of the week! I especially love it because I get to link up with Amanda! I love seeing what everyone else is thinking about. This week, I'm in full-on SPRING mode! The weather has been consistently above freezing (just a little rainy!) and I'm loving running in shorts and t-shirts. I'm about ready to pack away some of my sweaters, and I'm ready to start shopping for spring! 1. Bright T-Shirts : Love the scallops on this one from Top Shop. This one from Madewell looks so soft! 2. Printed Rompers : I have this same one in black-might need to buy all the patterns. Also obsessed with the print on this one. 3. Soft Shorts : From the upcoming Lilly Pulitzer for Target collection. I also love these from Forever 21. 4. Pleated Skirts : Love this striped version from JCrew Factory. I've had this one from Uniqlo pinned for months. 1. D'Orsay flat : I've been obsessed with these flats from Madewell for the past year. These are more in my price range though! 2. Printed Scarf : This dotted one from &Other Stories is so cute! H&M has a similar style with a bigger print. 3. 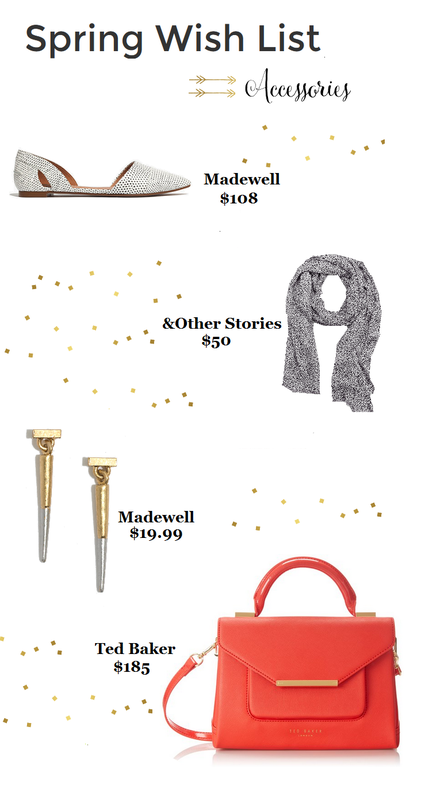 Spiked Earrings : I love the mixed metal on this pair from Madewell! I'm also obsessed with the ear jacket version at Bauble Bar. 4. Colorful Crossbody : This is such a cute bag, but a bit expensive for me. This one from Target is similar for much less! 1. Tinted Moisturizer : I like to lighten up my face makeup when it's warmer, and this is supposed to be a great formula. I've heard that Rimmel's is really good too! 2. Colorful Liner : Best liner I've ever tried, drugstore or high-end. I love using liquid liner, so I might have to try out one of these pretty colors. 3. Cream Shadow : This formula looks perfect for warm weather and I love the color. I've always loved the Maybelline Color Tattoos as well! 4. Coral Lips : La Creme is one of my favorite lipstick formulas . I would love to try a YSL gloss (so beautiful!!) but I don't think I could justify spending over $30 on a gloss.. Linking up with Nicole treat yo'self Thursday! I'm most looking forward to ditching the socks and being able to wear flip flops and sandals lol. But I love that you mentioned makeup since I'm a total beauty junkie at heart. That tinted moisturizer really is wonderful -- I need to stop by Sephora and pick up another tube! Ahh I know what you mean! My feet want to breathe! I'm happy you like that TM..I'll definitely have to try it out now! Love these looks. I want that JCrew skirt as well. Super cute! 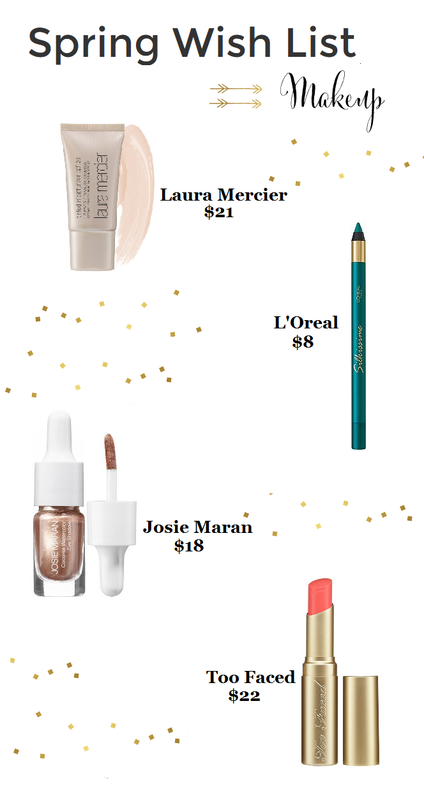 I also love the Laura Mercier! One of my favs. GAH I need new clothes. Like for real. Who wants to buy me some??? Any takers? I'm doing some shopping myself. I'm using Napa an the excuse but I know some of what I'm buying can be worn at work. Vacation is always a great excuse to buy new stuff!! I nearly just jumped off the couch (but not out of my PJ pants) and sprinted to Target. I love that J Crew skirt! I have the Josie Maran cream eyeshadow and love it. It's what I wear when I'm short on time since its quick to apply and looks great. I have the rose gold color, which is warm and soft.